Email is dead? While naysayers have been forecasting the demise of email for years, this reliable channel continues to deliver the highest ROI for brands and companies. What is dead, however, is the ignore-mobile-for-now, head-in-the-sand mentality. The rapid proliferation of smartphones means that a mobile-first email design for brands who want to optimize their return is no longer a luxury - it has become an absolute necessity. In fact, 45% of email opens now occur on mobile - which equals a majority of customers who can’t be ignored. This shift towards mobile didn’t happen overnight, but the recent pace has been rapid - and it’s only accelerating faster. From 2011 to 2013, email opens on mobile phones devices increased by 30%, with mobile first taking the lead late in 2012. All in all, mobile use on smartphones and tablets have increased 500% in only four years. 72% of US online adults send or receive personal emails via smartphone at least weekly. 70% of consumers delete emails immediately that don’t render well on a mobile device. 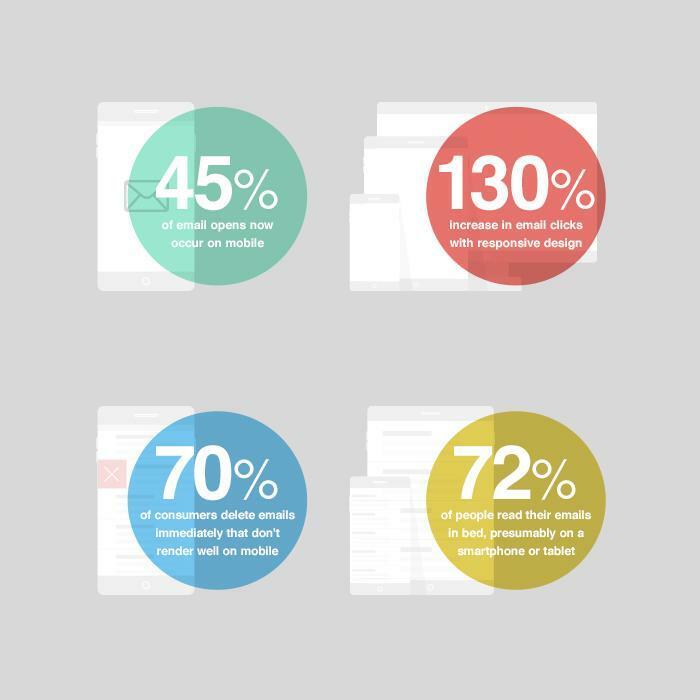 Responsive design can lead to a 130% increase in email clicks. 60% of global mobile users browse the Internet from only from their smartphones or tablets. 72% of people read their emails in bed, presumably on a smartphone or tablet. The record-setting Holiday 2014 season proved to be a major tipping point for mobile, with online sales from mobile devices up nearly 15% over the previous year. Mobile traffic in general was up even more - it accounted for 45% of total online traffic during the holiday season, an increase of over 25% from the same period in 2013. Smart brands are leveraging email marketing for mobile and providing a seamless mobile experience on any device. Clarity of message and simplicity of design are timeless qualities, but they are even more critical in the mobile era. The size limitations of mobile devices make it difficult for consumers to engage with your content, so it’s more important than ever before to be concise in your messaging. You wouldn’t buy a magazine ad using the exact same file as your latest billboard ad, right? That same mentality should drive your email design – specifically design for the small real estate provided on mobile devices. Since mobile emails still have to follow CAN-SPAM rules, make sure you offer an easy unsubscribe, a physical mailing address, and a clearly defined sender identification. Design for mobile devices, with ready-to-read fonts and tappable CTAs. This may sound obvious, but it bears repeating: Don’t use Flash! When possible, use display: none; to hide extraneous details in your mobile layout. Keep complexity to a minimum - many devices simply don't support media queries (for example, Gmail App). Keep the file size down (preferably below 100Kb) so that it doesn’t take a prohibitive amount of time to load. Mobile optimized emails directing traffic to a mobile optimized website is a recipe for success and increased conversions, so make sure your website is responsive. The debate is over - email marketing is alive and well, but mobile devices cannot be ignored. As the evolution to mobile continues to climb, email marketers must ensure that their emails are compelling, action-driven, and easy to read and navigate on a mobile device. Published on May 14, 2015 .